Led by Southern Medical Program students based at UBC Okanagan, the 2018 roadshow visits Sicamous, Revelstoke and Nakusp from May 6 to 12. Presentations times are 10:40 a.m. to 12:00 p.m., 12:45 to 2:05 p.m. and 2:10 to 3:30 p.m. Presentation times are 10:15 to 11:35 a.m., 12:25 to 1:45 p.m. and 1:55 to 3:10 p.m. 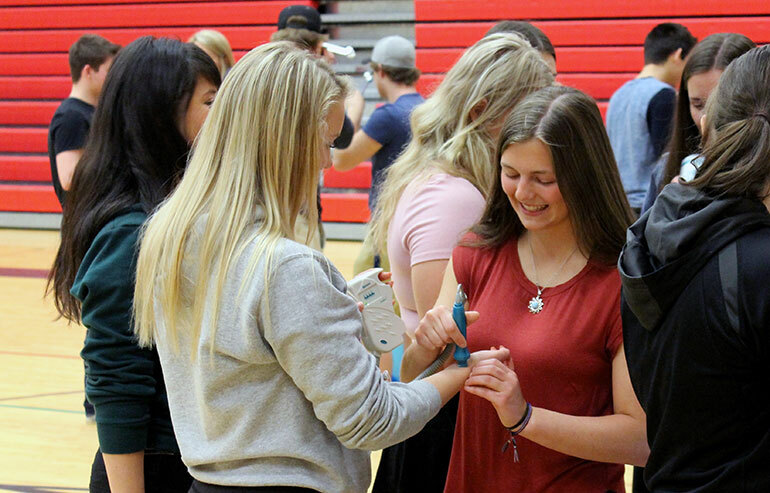 Presentation times are 10:25 to 11:40 a.m., 12:20 to 1:40 p.m. and 1:45 to 3 p.m.
Students at JL Crowe Secondary in Trail listen to each other’s heartbeat with portable ultrasound devices during the 2017 roadshow. The Healthcare Travelling Roadshow was conceived as a grassroots initiative to address rural healthcare workforce shortages. The provincial initiative has grown to include three regional trips each year in Northern and Interior BC. Since its inception in 2010, the roadshow has connected with more than 7,000 high school students in 32 communities throughout BC. The Healthcare Travelling Roadshow is delivered in partnership with the University of Northern BC, Southern Medical Program based at UBC Okanagan, Northern Medical Programs Trust, Rural Education Action Plan and Interior Health.